In the last few weeks we featured two excellent tools for history teachers: Chronas and Histography. Chronas allows you to explore the world history through the use of a colourful map together with a time slider beneath it. You can use the time slider to select a given period in time and view the events that marked its history. Histography is an interactive timeline that spans the history of humankind from the Big Bang to 2015. All historical content embedded in this timeline has been drawn from wikipedia and is self-updated on a daily basis. Historical events are represented by dots and placed on a chronological order. Today we are sharing with you another powerful web tool that is especially useful for history teachers. Museum of The World is a wonderful interactive timeline that takes you in a deep journey into history allowing you to explore some of the most fascinating objects in human history from different continents and cultures.”this project is a partnership between the British museum and Google Cultural Institute. For the first time ever, discover objects from the British Museum’s collection from prehistory to the present using the most advanced web graphics library technology available.Jump back in time to explore objects from acrid diverse cultures and listen to British Museum curators share their insights. 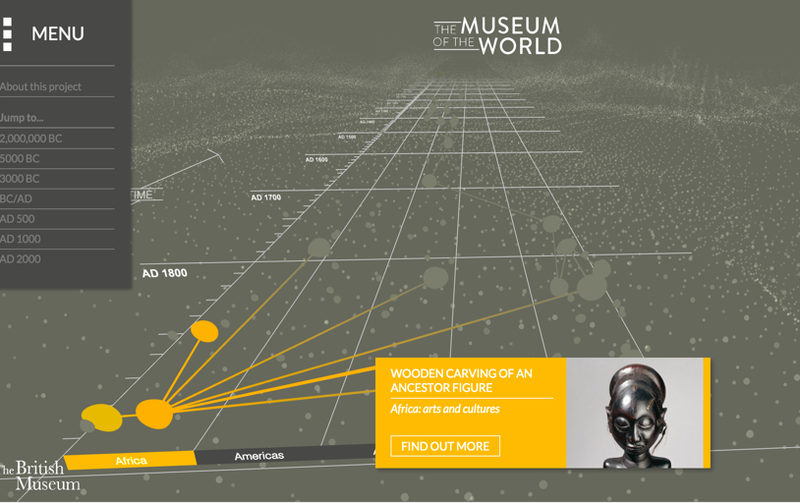 Click to connect objects across time and space, and discover hidden links between then and now. Take a look around, explore and learn something new”.